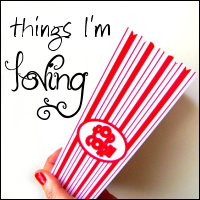 I am SO going to do one of these posts this week - there is SO much to be thankful for... and it's not that there hasn't been the previous weeks, it's actually been my chaotic life. This has meant I have had almost literally no time to myself, let alone on the computer (hence the lack of posts in general)! So I am taking a moment to at least start this post while Button sleeps - doubt I'll get it finished, but hopefully tonight it'll all come together and be posted for you all ;-)! Well it is now the following day - and once more Button is asleep, but once again I doubt somehow I'll get this finished in time to post... maybe tonight, or maybe tomorrow! 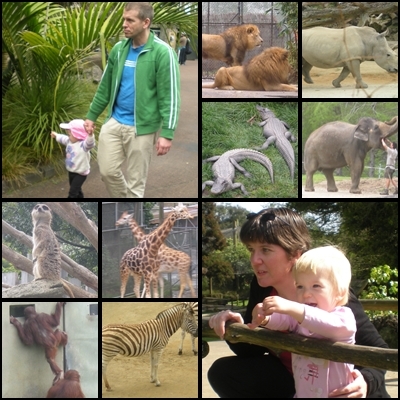 Two weeks ago we finally made our second visit to the zoo, if you have been following my blog you'll remember that our first trip (written about here) was a complete disaster! Well - this time it surpassed our expectations and Button LOVED it! In the end it was the perfect weather also - not hot, mainly cloudy and cool... much more enjoyable. It has been chaos here recently... total and utter chaos, but in a wonderful way! These school holidays have seen us hosting both sides of the family for short stays for various reasons or another! So Button has got to spend time with all her local cousins (she has some older cousins in Australia whom she hasn't met yet). 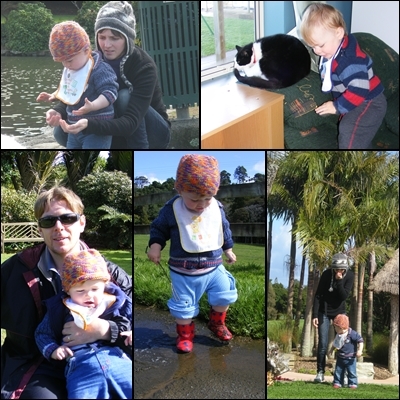 First my brother, sister-in-law and nephew came up from Tauranga for five days... they were attending a conference, but did it as a tag-team; which meant we got to spend time with both of them personally, as well as with Munchkin. My nephew is three weeks younger than Button and is approx. 10cm taller and 4kgs heavier :-)! He is a big lad, and if he continues growing at this rate it has been predicted he'll reach heights of about 6ft 6in; I don't think any of these pictures do him justice though (bottom three photos being Button and Munchkin)! It was a beautiful day as these photos show - some of these photos were taken by my brother and sister-in-law, and some by me. The 'Sculpture In the Park' has just started again - it goes right through summer every year... we love it, and always try to pop along at some stage and see what is on show. 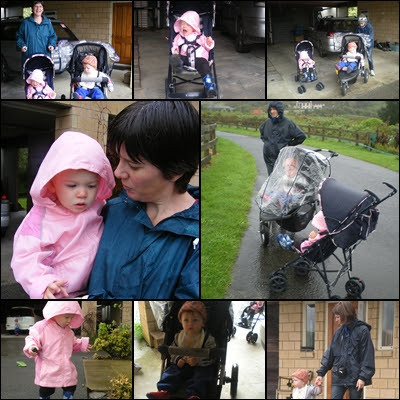 Another day Amy and I NEEDED to get the kids out - so trotted up the drive in the rain... despite the photo that shows Button screaming (top middle); she loved it! She was only screaming because she didn't want to be waiting around for photos - she wanted TO GO, thank you! Hehehe, thought it was funny, although she might not in the future!!! Talk about the drowned rat look! 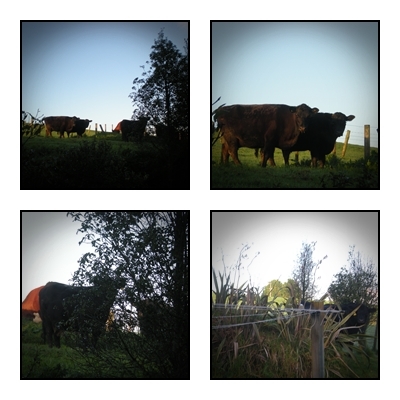 On the last morning they were here - we woke up to cows in our backyard! SERIOUSLY... could only happen in the middle of Auckland! Crazy! We live on a lifestyle block, and are surrounded by others with the same mindset - our neighbours cows had escaped sometime during the night and had decided, quite literally, that the grass was greener on the other side! 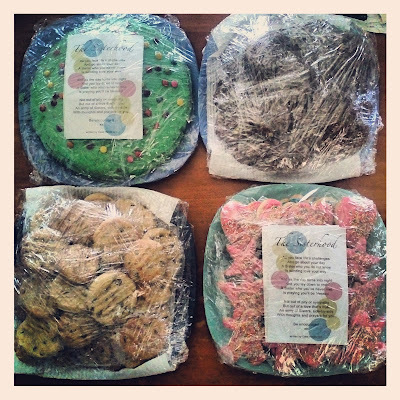 The kids LOVED it :-)! Then Mr. C's Mum came and spent a couple of days with us, she has been up in Auckland staying with his sister who has just had a baby. Then - quite unexpectedly I got a phonecall from said sister asking if she, her girls and Mum could stay a couple of days early the following week as they were getting lino put down. Of course we said yes, and rearranged the house again to accommodate everyone once more... SO thankful we live attached to a very large house and can 'borrow' extra bedrooms when required. Photos of Button with the girls are right at the top, the eldest is 2.5 years old (13 months older than Button) and 'our' precious wee baby is only 2.5 weeks - and totally gorgeous! 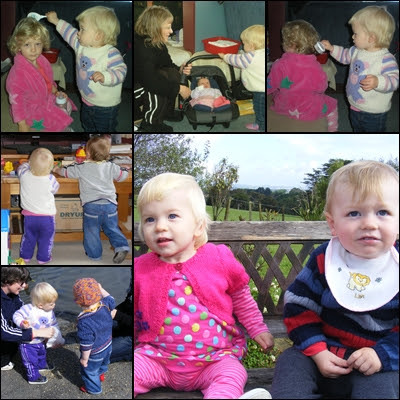 In the top photos you'll see Button brushing her cousins hair, and in the middle photo she is 'helping' Nana rock baby to sleep... so cute! 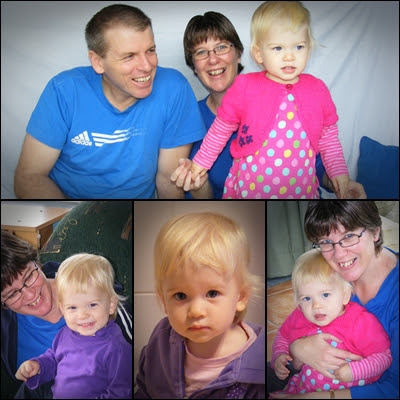 My sister-in-law is very good with the camera, and offered to take some family portraits of us while they were up from Tauranga... while they didn't all turn out as well as she'd hoped (what photos ever do with a BUSY toddler *grin*), there were definitely some lovely shots - so thankful for these! And as this whole post has basically been about family - what would it be without an update and some photos of Button herself! She has just (finally) learnt how to ride her little bike, and steer at the same time - yay! 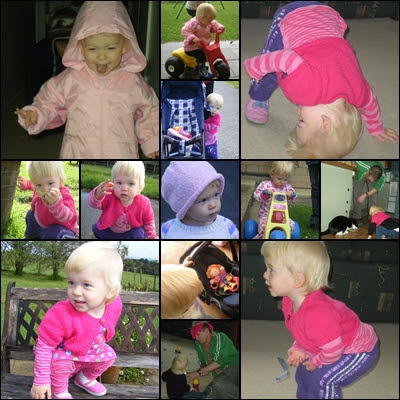 So there are a couple of photos of her on bikes (now a favourite activity inside and outside)! She is now insisting on pushing her stroller, rather than going in it - so there is a picture of her peeping out from behind the stroller to see how much further she had to go! Cute! Just learnt to jump - although of course her feet don't yet leave the ground... and the upside down 'yoga' pose is a favourite at the moment also! There is a photo of her having just picked some grass 'to feed the cows' up our driveway, and also one of her showing me her dirty hand after playing in the mud on the same walk! She HATES dirty hands, and will always ask for them to be cleaned after playing in something dirty or sticky! She LOVES supervising the cat while she eats dinner (although the cat doesn't seem as keen - I wonder why *grin*)! So there is a photo of her crouching over the cat dish, with Mr. C looking on to make sure she doesn't eat it herself! Mr. C is reading a book to her in one photo with her pink jersey and our sieve on his head - it just sounds better when he is 'dressed up' apparently! And one of her rocking the baby capsule that her cousin had been in, this time though it was only her baby doll in it... so cute! 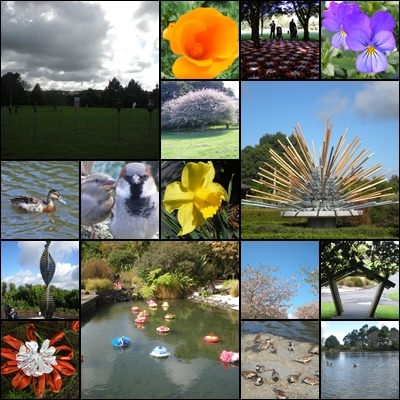 So many other things I wanted to write about, although maybe without the added help of photos! But it is now 10:15pm and I am exhausted and in need of bed... if I don't post this now, it won't get finished until next week; which basically means it is just not going to happen! So I will sign off and link this in FINALLY! great entry - loved catching up with the photos too..... especially the story telling one! Beautiful pics and such a precious baby!!! Didn't we have a nice time?! I loved looking at the photos and reminising. How's Button's bike riding going? I imagine she is racing round all over the place by now! Family is important and you're very blessed to have a wonderful family WITH kids similar/same age as yours.